Wouldn’t you know that bit happens to be one of my favorite bits for horses with soft mouths or horses that lack forward and don’t trust the bit enough to go forward. It transformed my horse and has done the same for many of the tb’s that come in here confused about contact. I had been riding Sea Flip in a eggbutt with a bean in the middle. I prefer eggbutts over loose rings in the beginning of training because the horses don’t really steer and I think the loose rings tend to pull through their mouths a bit much. He has been fussy and reluctant to move forward which is my clue to change up the program. I put him into my herm sprenger duo which just happens to be a loose ring and added a figure eight. He was really good with this combo. Forward, soft in the bridle, lots of good slober and stretching down to the contact. Right now he really makes me laugh because he seems just so slow. 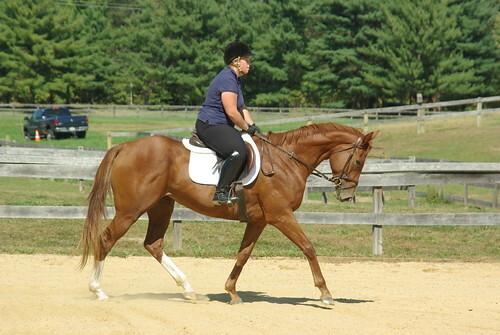 You pick up the canter and he likes to canter as slow as possible but like a giraffe. He has no concept of how to relax and go forward so we cantered around in a 2pt and then I sat a tiny bit and got a bit of flexion with gentle bends and got him softer in the bridle. 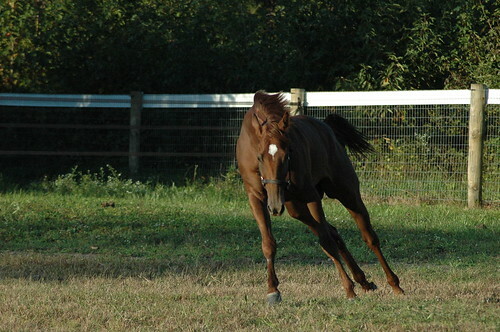 He has a lovely canter that is going to be incredible when he learns to soften everywhere. I can just see how easy it would be to jump some big jumps on him. We also jumped his first real jumps undersaddle which felt great! He jumped a little brush jump and a straw bale jump with confidence. He has gained a lot of trust because before he was being a butthead about even walking over those jumps in hand! 3 yrs…I tell you they have a mind of their own. It is all about making them work with you and not against you. I had a glorious day of hunting yesterday on my 8 yr conn/tb that I had previously evented until he injured his knee. I haven’t ridden him myself in a year because he been half leased to a student and filling in as my husband’s trail horse. Let me tell you how awesome it was to be back on him. 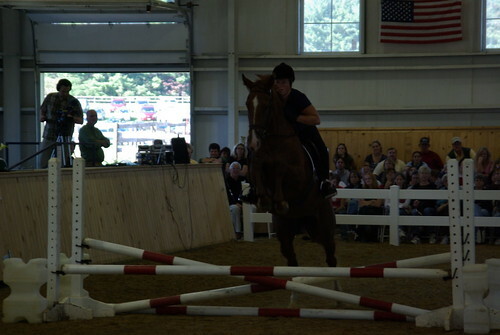 He is an incredible athlete and has always been one of the bravest and most agile horses I have ridden. Hotter than any ottb I have ever ridden as well 🙂 I think he would go for hours just for the heck of it…god help me when he is truly fit! He instantly took to hunting and had it all figured out within the first half hour. He stood quietly at checks, was great with the hounds, galloped respectfully and was a bit to eager to the jumps. I tried to go around the jumps because he isn’t supposed to be doing all of that but he was not having any of that. 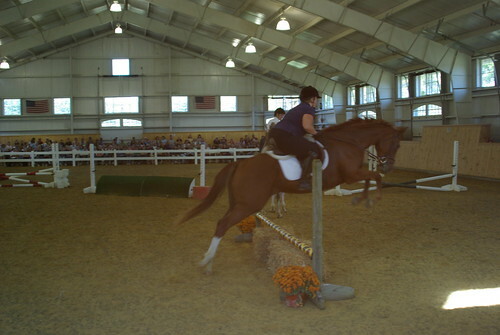 He was so rank about me making him go around I figured it was safer for both of us to just jump the jumps. Such a silly thing he is and full of attitude. I am planning on taking Sea Flip second field within the next few weeks to see if he enjoys hunting. I think there is nothing better for teaching a horse to be brave and forward than a good foxhunt. With the yucky weather last week I didn’t do much riding. Sometimes it is nice not to have to do anything for a change. There has been a lot of change going on at the farm with horses coming in and out. I am back down to two CANTER horses Sea Flip and Escape by Sea. Has anybody else been experiencing the change in behavior as the weather has changed to much colder?? Oh boy that is always fun! Last Monday, I was up in Pa with my horse and Bella went along for the trip for some people to look at her. I sometimes think people have different expectations than I do of horses. It was the first really cold day about 40 degrees and windy. I trailer up early in the morning. Bella had to stand on the trailer while I took my lesson and then I unloaded her and loaded up my horse. My horse gets all gooey eyes over mares and screamed and screamed for her making quite an interesting environment. I took her in the outdoor and she was quite high on life but you know what she is a 3 yr that has very little training under her on her 3rd trip off the farm ever in some really stressful conditions. Our first ten minutes of riding was like riding a horse that wanted to be silly but was doing her best to keep it all in. When I picked up the canter she wanted to go so I did a very strong transition back to the halt to let her know in no uncertain terms she had to listen. Circles and transitions keeping her working in a frame and getting her back relaxed and she returned to her normal self. I jumped some x-rails and a scary box all of which she did a nice job with. What frustrated me was the reaction of the buyers who basically made the comment that I was holding her to tight. Now can someone tell me how it is possible to take a horse that basically wants to blow and ride on a soft and loopy rein because I am not that kind of a miracle work and if you take a very green 3 yr and just throw away the contact and say fend for yourself you are likely not teaching them a single thing. I do take up a contact but I ride them forward into the contact so I am not just cranking down the head with nothing coming from the hind end. I don’t ask them to come into a major frame just soften a bit and with Bella she likes to come on the bit without the rider needing to do a thing. I use a lot of circles and changes of direction to keep their mind on the job and to get them to focus. There were many negative things said about my style of riding. I walked away from day a bit frustrated because it is stressful enough to ride in front of other people and getting your riding picked apart doesn’t improve the experience. Riding green horses is not always about looking pretty and you tend to develop a lot of bad habits but I work super hard and being the best rider I can be. I work a full-time job in addition to trying to ride a few horses everyday so I never claim to be perfect. I am very aware of my flaws but I am also confident in my ability to produce a horse with really good basics. I make sure I lesson with the best of the best across disciplines and I am not the type of rider that wants my hand held or someone to tell me nice things. Quite the opposite actually! I really got a case of the blah’s for the rest of that week beating myself up about my riding but I have to focus on the positive and there are so many positives when you make yourself step back. Right now I am having the best rides on my personal horse. One of the most rewarding things for me is to fix a horse that was severely messed up. 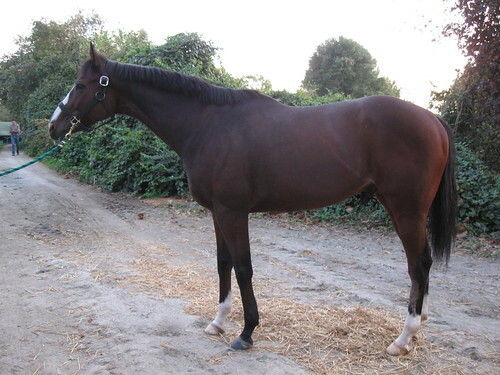 My horse came back from a training/sales barn this time last year with major issues. He is a lovely 5 yr old/tb who is just so extremely sensitive. I have no clue what happened while at the sales barn but he came back physically and mentally fried. I was told there was nothing wrong with him but physically he arrived back home sore. The other things weren’t apparent until I started riding him again. 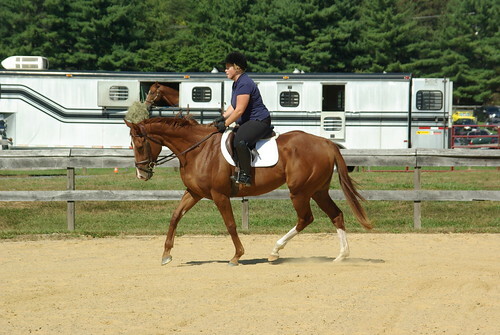 Fixing him has been a long road of trial and error that keeps teaching me to be a better rider every step of the way. The horse who returned like an inverted giraffe who was terrified of contact is now as soft as puddy and so rideable it amazes me. The horse who jumped in the shape of U (seriously..it was the worst thing I had seen) now jumps round and has gained tons of confidence. The horse who stopped at simple x-rails is now jumping 3ft like it is a walk in the park. Each time I ride him I get off with a smile and sometimes I look at him and just can’t believe it is the same horse. It has been a long journey with him but one that has given me faith in my training program. I am really thankful for all the great help I have received along the way from great trainers. Each time you think you know something you realize you always have so much more to learn. This horse helped me to add a few more tools into the toolbox. I have started to ride Sea Flip again am going to get him in a steady program now. We are about to start losing daylight and I have three horses that I am riding so I need to write down a schedule for them. If I am really quick I can get two ridden M-F and then all of them on the weekends. Sea Flip is such a good boy although very much a 3yr. 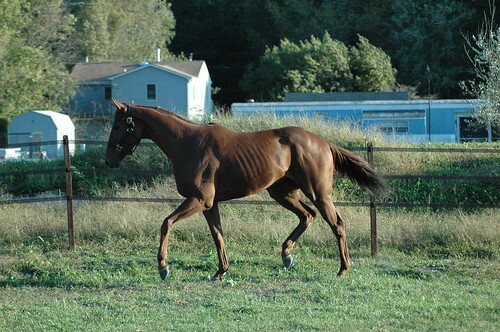 He has the typical weak hind end that I see on many of these racehorse that have been let down and lost their muscle. I am working on getting him to stretch into the contact and go forward. One thing I am going to try tonight is the HSprenger duo bit which is really soft and flexible. similar to a nathe bit and great for teaching them to hold onto something. I believe it is really important to teach them about contact from the beginning although I know other people disagree. I am not worried about a frame but they have to trust your hand and be willing to go forward to it. You have to find a bit they feel comfortable going forward into. We have moments of great work and other moments where he is going as slow as a western jog with his head straight in the arm going you can’t make me go forward. You have to deal with this because what happens when you have lack of forward and a really tight and tense horse??? Let’s just say it isn’t pretty. I don’t go off the farm until I have forward..we don’t jump until we have forward..and so on. His reaction to anything he doesn’t want to do is slowing down so I have to work to teach him to think and go forward at the same time. It is also not just forward with the head in the air because that still gets you into trouble because they don’t trust the contact so if you get in trouble and they start acting up and you touch their mouth and the go OMG ahhh don’t touch me you will have other problems to deal with that can result in misbehavior. Bella (escape by sea) came with forward and understanding of the contact already installed. Others do not. 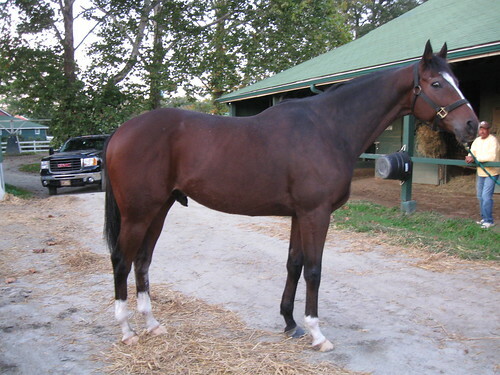 One of the biggest misconceptions about racehorses is that they are really forward and hot. 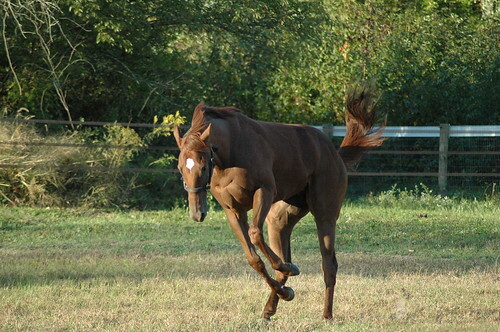 Sometimes they are only this way when they want to be but the rest of the time they have no concept of what leg means or how to go forward in the trot. 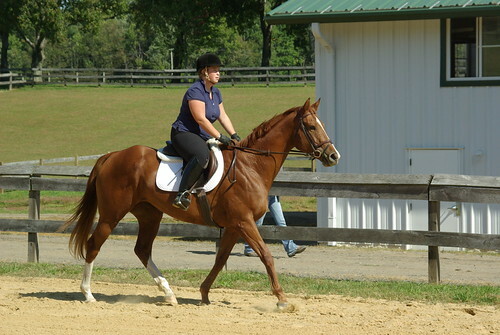 Cantering always seems easy but many just plain don’t learn now to trot at the track. I am looking forward to the journey with Sea Flip. He has so much talent so it will be my job to install all the right basics so that talent has a chance to emerge. When you sell a horse you always try to make the best possible match between horse and rider. When something goes wrong you do your best to make the situation right or at least I can say that I do. 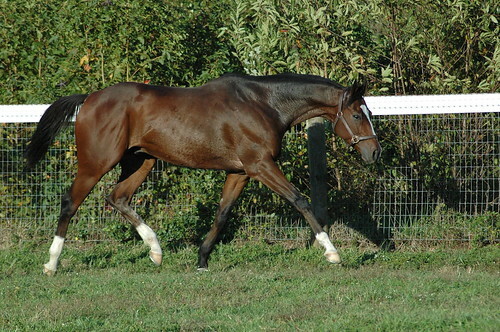 The horse world is a small world and your reputation is everything especially when it comes to buying and selling horses. 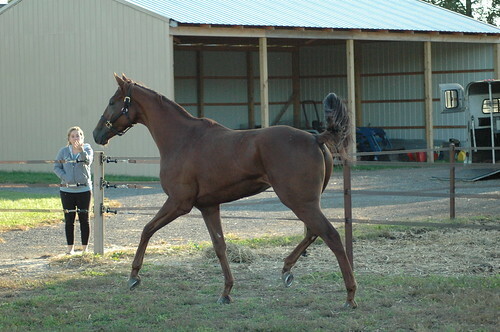 Morethanalittle was a horse that came through CANTER but was bought by a friend of Allie’s who then sent him to me for retraining. He arrived in June of 2008 and I had him until March of 2009. 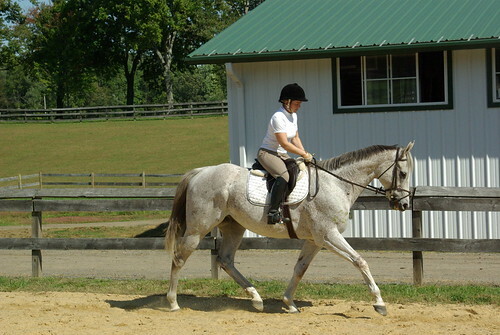 He was one of the easiest horses that I have had the pleasure of retraining and by far one of my favorites. His barn name was Mick or mcsexy. He was one good looking classy horse. 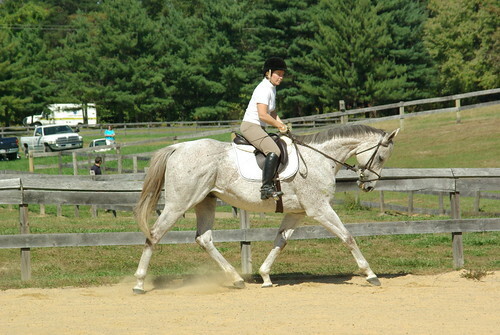 I brought him along putting a bunch of mileage eventing, hunters, jumpers and dressage shows. He went everywhere and anywhere during his stay and progressed really quickly. He was always so quiet and willing to do his job and a pleasure to work around. He was bought by the cutest 11yr girl you will ever meet who was a great rider. All was well at first but soon Mick started acting up in the warmup rings at shows. He was fine at home and fine at lessons but he had her intimidated at the shows. 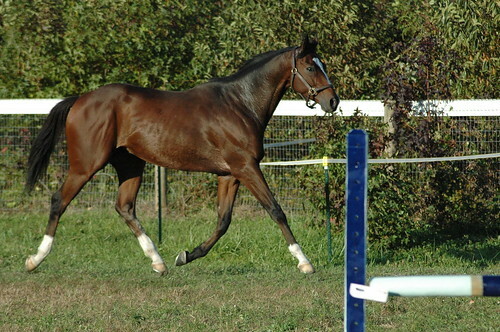 They decided they wanted to return him so he was donated back to CANTER and arrived at my house on Friday. They could have resold him but they decided they would rather send him back and know that he would end up in a good place. He was bought for a good chunk of money so I really admire them for making the decison to do the right thing for the horse. He will start getting evaluated here soon but I was giving him a few days to adjust. You can see why I am pretty excited to have him back again~!! This is Humble Rick which is the horse my friend is taking. He will be heading to his new home tomorrow morning but was able to get a bit of turn out yesterday evening and is happily munching grass this morning. Then I had to clap to get him to move and he was more interested in grass. Very non eventful and he would have rathered I not catch him. Pape was hilarious and basically ran in circles and fast as he could leaping, bucking and farting for about 15 min at a good clip. Athletic as hell and possibly 17h. Need to break out the measuring stick. Yesterday was a really fun day at the farm. I seriously love working with CANTER because when we get new horses in I feel like I am personally getting a present just for ME even when they are not my horses. The process of seeing them come right from the track and taking them through the initial retraining is so much fun and I can’t help but to get excited about it. He arrived around 7pm last night with another horse from the same trainer that a friend bought and is stashing at my farm until she can pick him up. The both walked in and settled in nicely. Pape is even better looking in person if that is possible and huge! He has an old bow on the left front but it is small and bow’s are no biggie in my personal opinion. Can’t wait to go home and turn him out to see what he moves like. I will be sure to post more pics soon! A few months ago our amazing CANTER public relations person convinced WHYY to interview CANTER about the new Delaware Park program. Tom Byrne from WHYY came down to the farm to interview me and see the CANTER horses and then a few weeks later we met up at Delaware Park where they came along for a track visit. I really think he did an amazing job on this piece. Here is the link to the actual tv broadcast- http://video.whyy.org/video/1285152934 either click on the picture of the horse or go the 21:30 on the time clock to find the piece on CANTER. 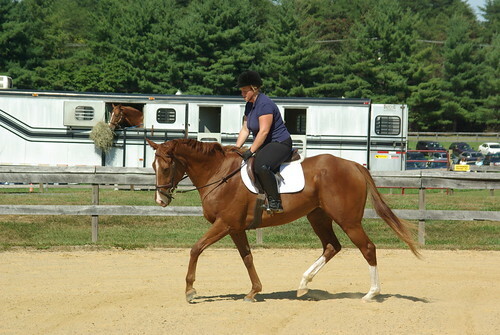 This is a shorter piece about the horses on the farm and more about how CANTER operates. It was set up so that first a jockey rode on a horse right off the track, then a group of horses recently off the track with a few months, a group with a year or more and then horses that are out there actively competing. We took Top Punch who was the 12 yr that we got from the track in June and Escape by Sea who I have had for two months or so. I wasn’t sure what to expect out of Bella going to a big event like this and when I saw the seating arrangement I thought it would be a challenge. 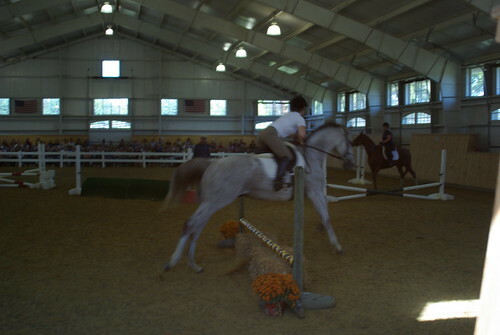 The indoor was tiny with several jumps set up and the crowd was basically right on the edges and the horses could touch them!! Bella had a slight moment when people clapped for the horse leaving and did a pop up and Kurt had to come out and hold her to get my mike on but once we got that settled she was great. I spoke about how important it is to have a plan and break down your exercises to keep it simple and then build from there. She w/t/c in a lovely balanced frame and although looking at the crowd she was quite good. 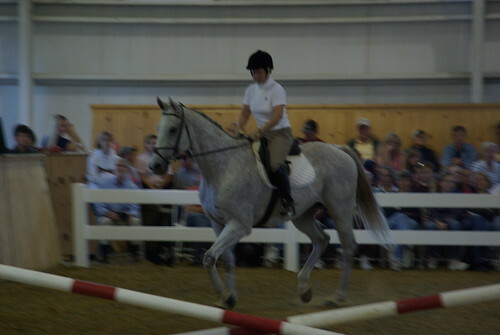 Jumped a pile of poles and then an x-rail in a huge fashion like 4ft in the air Everyone was oohh and ahhhing over her. She then jumped the snot out of the oxer and straw bales. She takes off a bit long and then really goes straight up so I felt retarded on her as always but she is just that challenging to ride over a fence. Huge jumper with knees up and a big push. Then he asked us to jump this 2’3″ rolltop which she jumped her first time!!!!!! She jumped so high her back feet hit it on the way down and she landed on a diagonal so she scared herself and stopped once on the represent but then we demonstrated my walk jumping technique the next time. 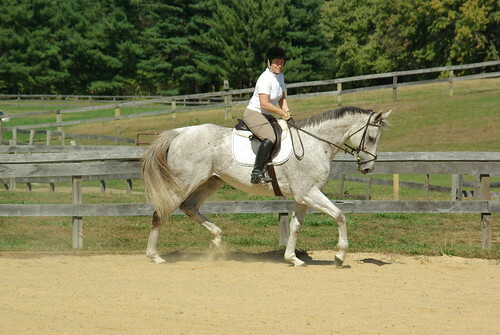 This mare is fantastic but he was right when he said she is not for your average rider. She jumps everything very round and big and is quite challenging to stay with. She has a lot of talent to go up the levels and is soft and quiet enough for a hunter but brave enough to event as well. Top Punch was perfect. Calm, relaxed and just admiring the crowds there to see him. He just stepped over the little jumps and although even newer to jumping than Bella he calmly stepped over the scary jumps without a care in the world. I thought it was a great compare/contrast of the types of horses out there. Bella is something that everyone wants even if they can’t ride it but Punch is probably the horse your average rider needs and won’t buy. I hope he illustrated that a 12 yr who just came off the track can still be a great mount. He is a super classy horse and Alison is just so happy with him. 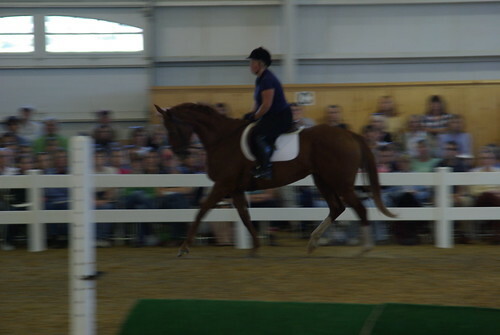 It was a great day and I was excited to show off what CANTER is doing with the horses. Punch is just learning to go in the contact after 10yrs of racing but I rode him two times and that horse is so darn smart he figured it out practically right away. Alison has done an amazing job with him!